John Mulaney and Nick Kroll have spent the better part of the last decade perfecting their roles as George St. Geegland and Gil Faizon — ancient roommates on the Upper West Side in their show Oh, Hello. Much like George and Gill are best friends, Kroll and Mulaney are also incredibly close — although their friendship is much healthier than their characters’. Working together closely for a decade has made Mulaney and Kroll almost like family. A dysfunctional family, that is. The comedians recently sat down with journalists to talk Oh, Hello, their Broadway show turned Netflix special and opened up about working together. But, these two weren’t alone in doing the show. 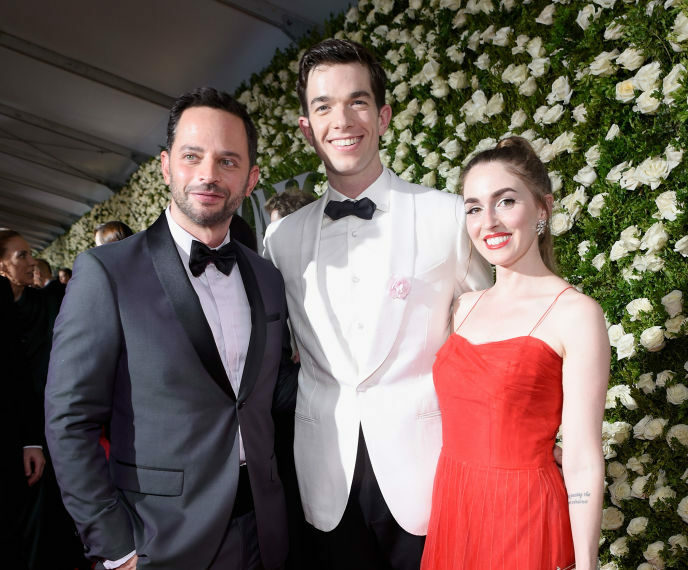 Mulaney’s wife, Annamarie Tendler, served as the makeup artist and “wound supervisor” for the production, and this made them feel even more like a family — with Kroll serving as the family dog. "[Annamarie] hangs out with Nick and I a lot 'cause she and I are married so it was just like—," Mulaney started. "And I'm their, I don't know if I'm their son or boyfriend, I'm not sure what the relationship is exactly, but I'm sort of their son-boyfriend," Kroll interrupted. "You're our dog," Mulaney responded, without missing a beat. The Mulaneys and Kroll’s close friendship formed the heart of the show behind the scenes. The two revealed that spending so much time with the crew on a show created a close familial bond between them. "We had a great little family," Kroll continued. "When you do a show like this, you have this little family of people who make it and..." "...And at the core was Nick and I and Anna in the makeup chairs for two hours every night," Mulaney finished. The two revealed that they’re currently working on a followup project for Gil and George and very much hope that Tendler joins them on the project as well — unless she’s working on another show or making Victorian lampshades, according to Mulaney. Oh, Hello is now available to watch on Netflix!